In collaboration with the University of California Cooperative Extension, I was invited to present to the Ventura County Master Gardeners on Water Conservation gardening. Monique Myers and I presented an overview of the stormwater problem, and showed examples of Water Conservation and "Ocean Friendly" gardening techniques. The group seemed excited about it, and will be working on projects relating to this topic. Among the goals for the Master Gardeners is to have them develop a training program to teach other garden clubs and gardeners in the county, as well as construct one or more demonstration gardens. How better to reach the gardeners than through Master Gardeners? Late last night Ventura City Council took a significant step in the RIGHT direction. 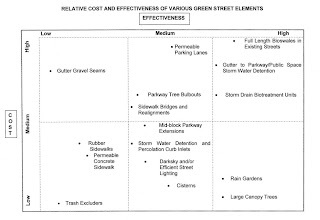 Recognizing that stormwater is an issue for which the time has come, council approved policy for Green Street Elements and Demonstration Project. In my public testimony, I reminded listeners that a 'green streets' strategy is the best way of dealing with the 'concrete jungle' that is impacting the health of our oceans. I also presented City Council with a hard copy of our document published earlier this year and the Ocean Friendly Gardens brochure. 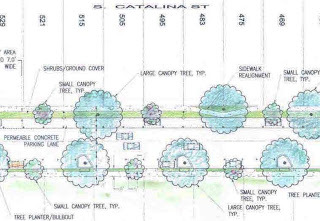 ...widening the west parkway from 3-feet to 7-feet, installing permeable concrete in the parking lane on the west side, planting 36-inch box trees on both sides, constructing "bulb-outs" along the east side along with stormwater detention and percolation curb inlets. In a later agenda item, council became the first city in the state to endorse the California Ocean Protection Council's "Low Impact Development Resolution." 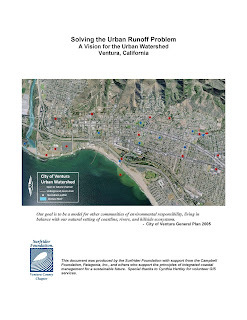 After our watershed tour earlier this year, and the city's proactive approach to stormwater, we are hopeful that more funding will come available to implement a watershed-based study and pilot projects based upon Surfrider recommendations. "the county could end up paying millions of dollars to residents after a judge ruled Monday that four projects built by the county diverted high water flows from the Ventura River that slammed onto the bottom of the Monte Vista bluff, causing erosion and damaging houses...The lawsuit, triggered after a January 2005 storm, was filed by 28 plaintiffs who reside in 13 houses on the bluff in Oak View." 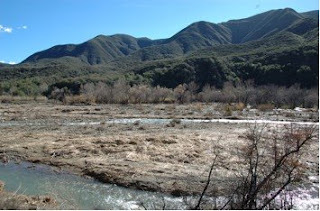 Studies done for the Matilija Dam Ecosystem Restoration Project identified this reach of the river as a problem area. 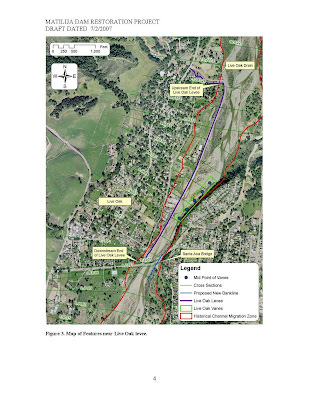 See Hydrology, Hydraulics, and Sediment Studies for the Meiners Oaks and Live Oak Levees - DRAFT Report (July 2007). The Matilija Dam project will widen the Santa Ana bridge and reconstruct the levee, which was also damaged in 2005 storms. 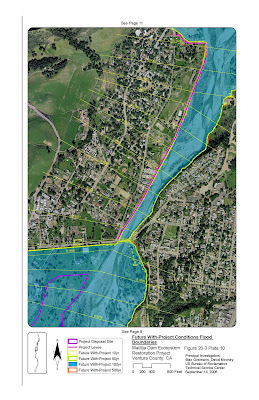 These flood maps clearly show the constriction in the river's floodplain formed by the Live Oak Levee and the 'pinch point' at the Santa Ana Rd bridge. The lawsuit alleges that the combination of four projects caused erosion of the toe of the bluff across from the levee. From 1974 to 2000 the county has constructed the Santa Ana Boulevard bridge, the riprap/levee that protected Live Oaks Acres, a riverside dike and the 2000 Live Oak Creek diversion project. In 2005, Watershed Protection District constructed rock 'vanes' to deflect flows away from the bluff. And surely more engineering is in the future. 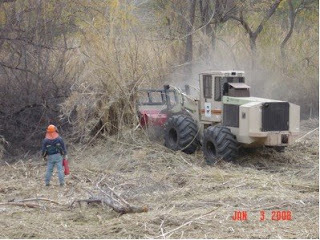 This case clearly illustrates the 'no-win' situation when trying to control a river within its floodplain. The resulting cascade of public works projects are an ever increased burden on the taxpayer, both in construction/maintenance and damage claims. Costs escalate even further as government agencies squabble over degraded water quality and loss of habitat as dictated by the federal Endangered Species and Clean Water laws. 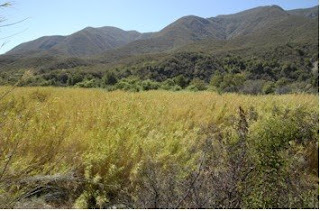 Around 20 people showed up at the Chaparral Auditorium in Ojai to hear the latest on the Arundo eradication efforts in the Ventura River watershed. This first on-the-ground action in preparation for the removal of Matilija Dam has caused some concern among local residents, who had numerous questions about the safety of herbicide application. County staff said that they have used approximately 1200 lbs of glyphosate per month since last September. (Glyphosate is the active ingredient in the common weed killer 'Roundup.') According to the County, none of the water sampling during the spraying has detected any of the chemical. Some commented that the chemical may be toxic at levels below the laboratory threshold, and others said that they had felt ill from exposure to overspray. As this photo illustrates, the giant reed often resprouts from the roots after initial treatment. The project managers also outlined a schedule for 're-treatment' of the 1100 acre project area. 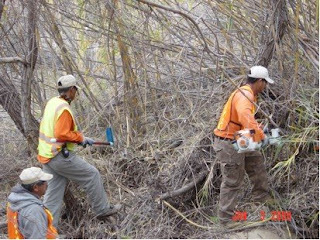 Followup crews will scour the canyon and treat resprouts quarterly for the next 5 years, after which, hopefully, there will be very little Arundo donax remaining. Without diligent followup, all that herbicide would be for nought. The photos below illustrate the progress - wow, there's a creek up there!